Over the past twenty-five years researchers have been concerned with understanding the science student. The need for such research is still grounded in contemporary issues including providing opportunities for all students to develop scientific literacy and the failure of school science to connect with student’s lives, interests and personal identities. The research reported here is unusual in its use of discourse analysis in social psychology to contribute to an understanding of the way students make meaning in secondary school science. Data constructed for the study was drawn from videotapes of nine consecutive lessons in a year-seven science classroom in Melbourne, post-lesson video-stimulated interviews with students and the teacher, classroom observation and the students’ written work. The classroom videotapes were recorded using four cameras and seven audio tracks by the International Centre for Classroom Research at the University of Melbourne. Student talk within and about their science lessons was analysed from a discursive perspective. 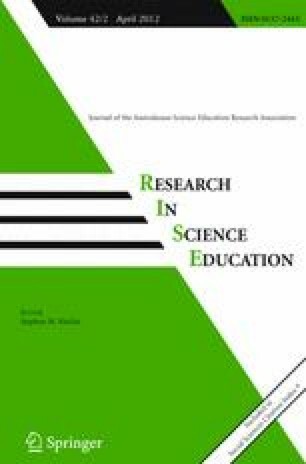 Classroom episodes in which students expressed their sense of personal identity and agency, knowledge, attitude or emotion in relation to science were identified for detailed analysis of the function of the discourse used by students, and in particular the way students were positioned by others or positioned themselves. This article presents the discursive Umwelt or life-space of one middle years science student, Tasha. Her case is used here to highlight the complex social process of meaning making in science classrooms and the need to attend to local moral orders of rights and duties in research on student language use, identity and learning in science. Extract headings refer to the segment of the lesson shown in the transcript. It includes the lesson number and an interval corresponding to minutes from the start of the lesson. Equal signs indicate latching between utterances. Punctuation marks are used to mark speech delivery rather than grammar. A period indicates a stopping fall in tone; a comma indicates a continuing intonation; a question mark indicates a rising inflection; an exclamation mark indicates an animated or emphatic tone. Audible outbreath (sometimes associated with laughter).